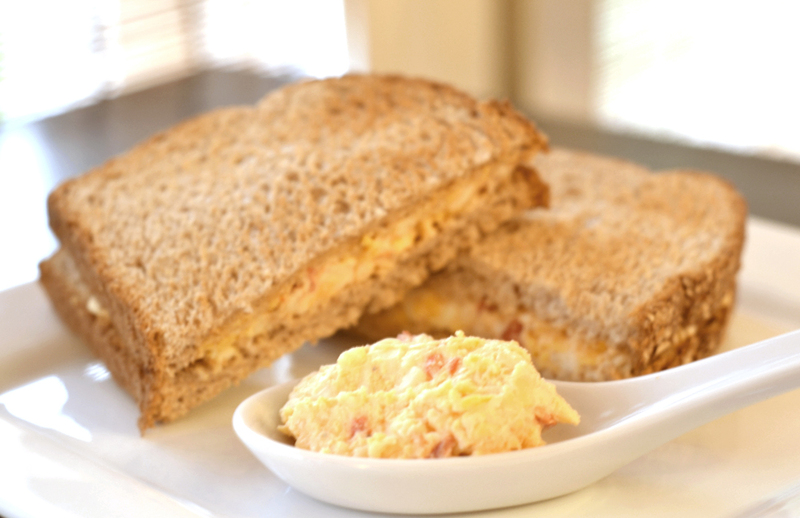 Pimento cheese is one of those things that slipped under the radar until I moved to the South ten years ago. It's not to be found in California, and when I moved to North Carolina 10 years ago, I think I must have tried one in a hurry, prepackaged from a grocery store, and thought, "Eh." It did the trick when I was starving, but wasn't something I sought out. You can find it in any true Southern deli, and the range of quality is as wide as the South itself. It can be delicious and it can be downright nasty. I decided to try my hand at making it at home this weekend because I really, really like the idea of Pimento Cheese. My husband was skeptical, but I won him over in the end. You can play with the flavors a little here--add a little more hot sauce for more heat or more garlic for kick--but I like the combination below for its balance. Now, if you're not from the South, you won't know what to do with this! Most Southerners just spread it on some white bread and eat it plain. And although I'm having it this way for lunch today, I'll show you later in the week what I actually made it for. Shhhhh...it's a surprise! Whip the cream cheese with a mixer until light and fluffy. Add the rest of the ingredients and mix well. Keep refrigerated. Yum! So glad you like pimento cheese! My mother in law makes the best version I've ever had. Being from NC, we eat it any chance we get! I'll have to give yours a try! I just recently made pimento cheese for my mom's birthday - very similar recipe although I never thought of putting hot sauce in it! When we first had it in South Carolina we didn't know how to eat it either so my brother and I just started putting it on everything - including BLTs (which was by far the best). We'd also mix it into our eggs, put it on our hot dogs, or just use it as a dip with pretzels and crackers.